I have worked really hard on this pattern and I am so proud of it that I wanted to share some of its story, and share some pretty pics too. 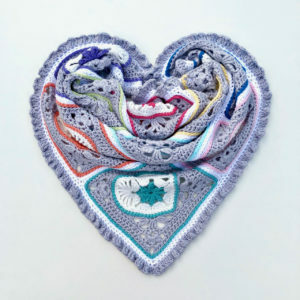 This pattern began in 2016 when I was playing around with a cute heart pattern I found online. 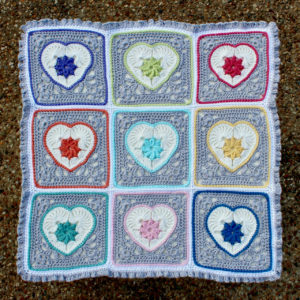 It was based on a simple square and I thought “how cute would this look with a flower in the centre” and not long after that the Heart in Bloom motif version #1 was born. I made a couple more versions but couldn’t decide which one I liked best so I shared a photo of my 2 favourites in a Facebook group I’m a part of and was blown away by the love! Honestly I’d never had this kind of attention for anything before and quickly wrote up the pattern. It was my 4th pattern and so much fun to create but some people wanted to know what to use it for. I originally made some bunting with mine (available to buy on Etsy) and this year I made a Valentine’s Day card with free printable (here). I figured it would also be a lovely large appliqué but then someone suggested that it would be more useful as a square. I thought that was a wonderful idea and fairly quickly came up with some ideas to try out, with try turning out the be the operative word! I actually lost count of how many versions there were. How many drawings, charts, crocheted and frogged squares, how many rubbed out lines and maybe this will work stitches. I had trouble getting my heart to stay looking like a heart and my square kept turning into a trapezoid or rectangle. It was thrown in the naughty corner more than once! Talk about frustration! My 5 year old son got a really good lesson in how to handle being frustrated, which at times was the only bright point, and a lot of other things got made while I rethought things. But I persevered (I’m quite stubborn and can’t say no to a challenge like this) and after a few months I had a working design. Now at this point I could’ve written up the square pattern and been done with it but I decided I wanted to make a finished item with it, a baby blanket, and include a join and border pattern. I did the tutorial photos (there are over 50 of them as I really wanted people to have all the tools they needed) and got my 9 squares done. I eventually got the pattern out to be tested and while I waited for some feedback from my lovely testers I got on with the join. I tried an idea I had early on but it was too much so I decided to keep it simple with a flat zipper join and have a bit more fun with a cute ruffle border. And here I ran into a new problem!!! When I joined the squares, what sat flat before suddenly became cupped as the join was too tight. Noooo! So I went back to the square and redesigned the last round, tweaked a few things and redid the relevant tutorial photos. I also reformatted my pattern layout according to some feedback from my testers (who are the best), tested the redesigned square with a join, finished off the blanket and prepared for the final photos. And here we are! 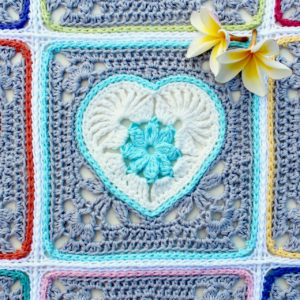 The Heart in Bloom Square, a continuation of the Heart in Bloom Motif, is now out in the world. It has been a labour of love and I sincerely hope you love it too. So let’s make out hearts bloom and bring some colour and joy into our worlds with some lovely yarn and awesome hooks. 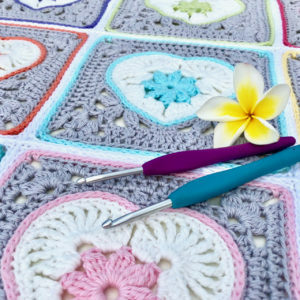 Let’s enjoy the journey as well as the destination and crochet a little love today. Pattern available through both Etsy and Ravelry. 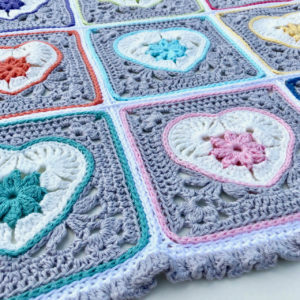 You will need both patterns – the Heart in Bloom Motif as well as the Heart in Bloom Square – to complete the square. Or you can get the 2 patterns in a Bundle here. If you do create some Hearts in Bloom I would love to see them. or link to your project on Ravelry.